Normally I don’t discuss a lot of political stuff and government-type news. We get enough of that every day, I feel. But this latest proposal hits close to home…in fact, it hits our family directly, and possibly yours, too. The US Department of Labor has submitted proposed new “rules” regarding children under the age of 18 working agricultural and non-agricultural jobs. Some of them make sense, and seem almost silly that we need to have a law for it. (Who truly believes that a 16-year-old should be allowed to work with dynamite?) Yet others would severely affect our farm…and many farms across the country. The proposed laws would eliminate children from the farm-labor work force, or at least not without proper training and certification. Sounds great, right? I’m all for more safety on the farm. But upon closer inspection, these rules do very little to ensure safety and do a lot to infringe upon farm families. For instance, a child would no longer be able to pick up sticks and branches around the yard while Mom or Dad is using a chainsaw, or some other mechanical method to bring down trees and shrubs. 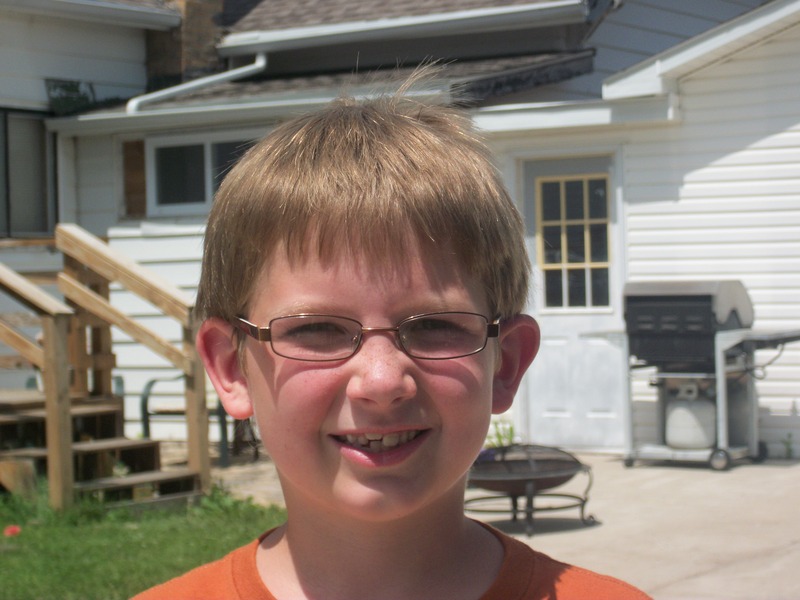 (Actually, the child couldn’t be using ANY power tool…that would include battery-operated drills, screwdrivers, etc.) The only exemption would be if Mom and Dad own the farm wholly on their own (not in cooperation with someone else, including family). I know that not everyone is aware of this, but many farms incorporate and set up business structures, so that success can be shared throughout the family equally, same as expenses. Is this the closest he'll get? EJ, keeping me company while waiting for the silage cutter to be fixed. And yet one more silly section would make it against the rules for anyone under the age of 18 to even ride IN a tractor with someone who is working, or in the process of working. How in the world are we supposed to educate and involve the next generation? What about those that don’t have farm backgrounds, but are interested in becoming involved in agriculture? How do we tell the next generation that we don’t want their help, until they’re adults? One thing I have learned quickly, raising four boys, is that the more involved I get them earlier on, the more they enjoy and want to learn about the farm. If you leave them out, where will farming be in 40-50 years? 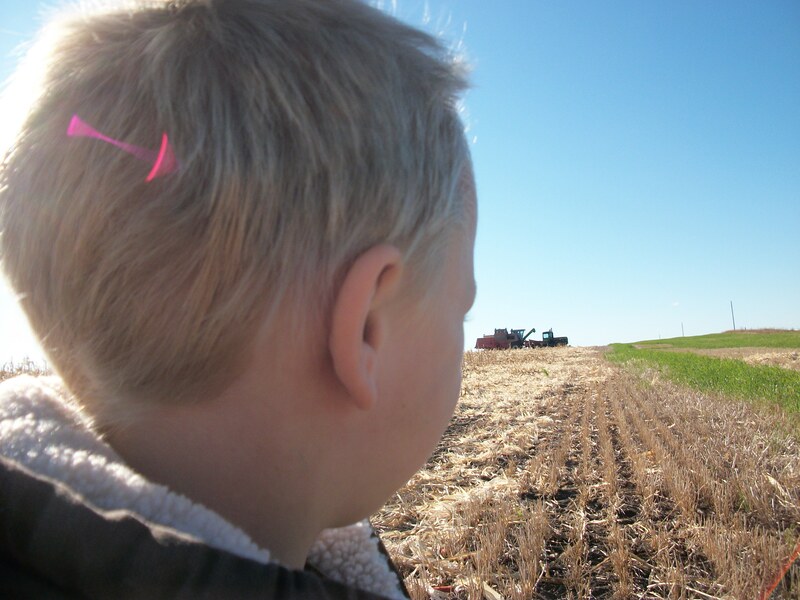 Waiting his turn...his dad is in the tractor, his grandpa is in the combine. Is his future in jeopardy? The answer is not clear. Would children be able to show their animals if their parents weren’t direct owners of their operations? Would they be able to sell their livestock and receive the money for college funds, as so many kids in 4-H do? My oldest two have found excitement and education in 4-H. Is that in jeopardy as well? I understand the need to update regulations…the present set hasn’t been updated since 1970. Yet, can common sense come into play, please? They rattle off statistics of children that are injured or killed in farm accidents, but if you look closely, some of those statistics are misleading. One such example they give is a 17-year-old who was illegally employed and was a fatality in an accident. The way I look at it, if the child was already illegally employed, then changing the laws would do nothing to ensure that child’s safety. Laws only protect those that follow them. Yes, I’m all for protecting our children, especially those that live on or near farms, but we cannot protect our children while making their home off-limits and telling them that they’re not wanted, or needed, on the farm. That’s a disservice to all. Comments on the proposed changes are being accepted through TODAY, please make your voice heard. Visit www.regulations.gov, it’s RIN 1245-AA06. Today is Thankful Thursday. Today I am thankful that my children can be raised on our farm, in a safe and loving home. I’m thankful that I, as a parent, can teach and instill in my children the love and respect for the farm that it deserves. But it’s MY job to be a parent…not my government’s. 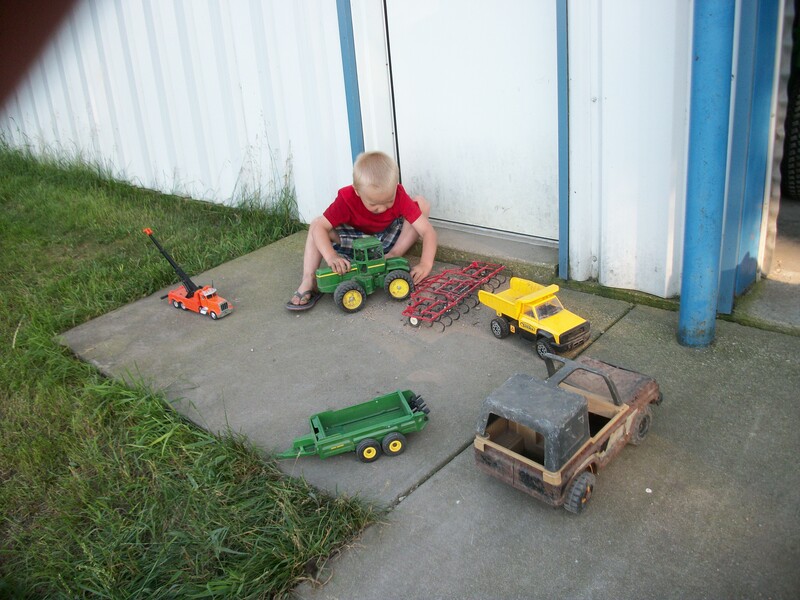 This entry was posted in Agvocacy, Boys, Farm life, Thankful Thursday and tagged agriculture, agvocacy, Child Labor Laws, children, children farming, farm life, farm questions, future farmer, life on the farm by wagfarms. Bookmark the permalink. Oi, it’s legislation like this that scares me. Aside from the politics/legality of it all – I feel like I do a pretty darn good job of deciding what is/what is not safe for my children. Our children are still small (4 & 2 and one due in Feb.), but they are still capable of helping with chores around the farm, even if it’s just picking up sticks or carrying buckets. It teaches them responsibility and to work hard which we value highly. How are we to raise future farmers if they can’t start learning until they’re 16? Then they’re already at an age with a lot of distractions such as school and social happenings. My husband is also in the ARNG and is gone a lot because of it, leaving me home alone to take care of things alone with small children to keep as well. There are times where I physically can’t get chores done without taking the boys with me. We live/work on a dairy farm and I also have a small hobby farm on the side. How can I teach my kids how to milk a goat when the milking setup is in the same building as the kidding pens? We heat our barns and some of our family members’ houses with wood stoves. Chopping firewood is a constant around the place and we need all the help we can get. We take precautions to make sure that the kids are safe, but we still need all adults out to help sometimes. My kids also LIVE for tractor rides with their grandpa. They’ve been riding on the tractor since they were 4 mos. old. It’s not just a fun ride, they’re learning the gears and what all the levers do to work the machine to get work done. Then you look at the statistics. It’s easy to see numbers as being large when they’re only in one context, but where are the reports comparing injuries and deaths of children on farms to those of injuries/deaths of children who live in inner-city neighborhoods? Areas where kids are very often left on their own for hours or days at a time in unsafe neighborhoods with no parental supervision at all where there are drugs, prostitution, and gun fights on a daily basis. Despite the dangers on a farm, I can’t fathom that it’s any more dangerous than living in a neighborhood where crime is a daily nuisance or even living in a sub-urban area with traffic, stray animals, and still fairly close to regular crime. Capitol Hill doesn’t understand that they aren’t just keeping kids out of a workplace for safety reasons – they’re telling farm parents how to raise their kids beyond the level of the spanking vs. child abuse debate, and they’re affecting the very livelihood of farm families. Thanks for the info! I had no idea! I agree…we send our children to Tractor Safety training, work along side them to teach them the dangers and what to look out for. Yes, accidents will happen, but they happen all the time and not just on the farm. We had an excellent speaker for one of our 4-H meetings who taught the kids on animal safety. She was a vet tech and told them how to watch for signs like their ears are straight up, the tail is tense… it was very educational for all of us, not just farm kids…some kids just had pets. I don’t know if this Federal bill included the new requirement for everyone to have a CDL to drive on the roads, even tractors…in WI you have to be 16 for your regular license and 18 for the CDL…that would put a lot of farm families in a deep world of hurt for this one, too. It is like they think we don’t have any common sense anymore in this country….farm kids are raised to think for every action, there is a reaction and to think before you do something…the farm is our classroom to teach, to experience, and to grow. No one should take that away. 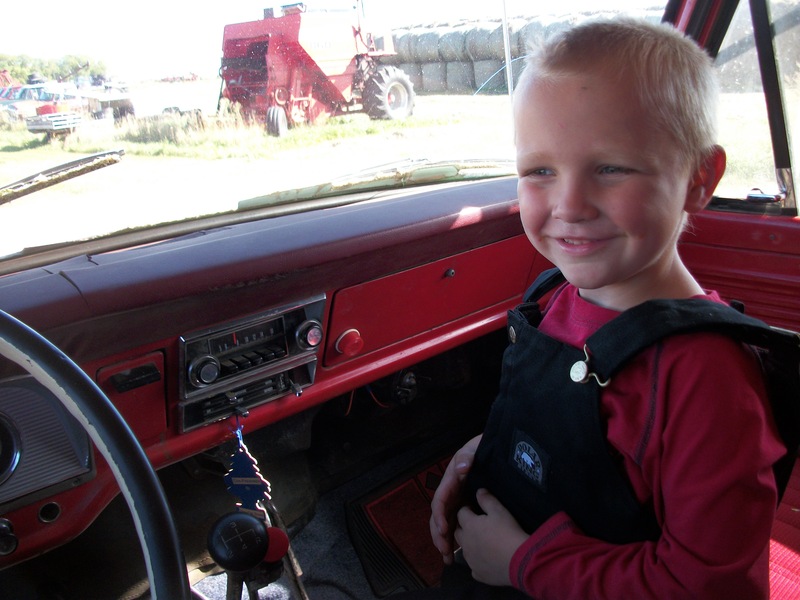 I am proud to be a 3rd generation family farmer and so are my childen. Once again our government is trying to “regulate our safety” which is impossible. One of the responses mentions the inner city and suburban issues that are very dangerous to children – well what about sports? In New York a student athlete was killed playing football last month….does this mean that we should eliminate sports from the high school program? Hundreds of student athletes are injured playing sports every year, and yes some are killed, but we continue to see the value in these programs and support them. Families should have the right to raise our children and teach them the responsibility of work, discipline and good citizenship. I own my business and am very concerned that these new rules will cause issues with my children working and learning our business. I grew up on farms and ranches and I’m the oldest of four. My youngest brother would cry and beg to be put on a tractor with my Dad. This bill would never have let him do that. I don’t currently live on a ‘farm’, and with these regulations in place my family would no longer be able to have show lambs (I’m over the age of 18 but my brothers are not). This is ridiculously frustrating – we have to feed 9 billion people by 2050 so they want to cut our labor force in half by limiting the growth and development of our future farmers? That’s not real smart. Thanks again for posting; putting this bill into ‘layman’s terms’ so that others know what’s going on. I think that what you posted made a great deal of sense. However, what about this? Children on the Farm | Wag’n Tales is kinda boring.